Thanks guys for the suggestions! Currently I’m using a code name “remirror” since it is short and easy, and it wasn’t already in use for any other purpose (checked Antergos, Arch, Manjaro, including AUR on all of them). Anyway, the tool itself is starting to be ready for larger testing. In my tests it seems to work without issues, but the more testers the merrier! So I’ll be releasing a “beta” version during the days to come, and announce it here as it gets released. Hopefully many people will test it and report any findings. It will install the tool as /usr/bin/remirror. Feel free to test it and report any findings! Ooooh… thank you!!! I’ll be trying it out (or at least, I plan to) in the next day or so :) . Once again, thank you so much for the astounding work and scripts @manuel! Since Antergos is aimed at human beings (mean: not at geeks only), you could think of adding GUI. If it can still run as a systemd service, the most easy way is to run it as this automatic. @joekamprad One way or another - a simple solutions for beginners would be not bad idea. Actually I already wrote an experimental GUI for it. So far I’m not quite satisfied with the results, But I might later release that, too. But as @joekamprad said, the best use of this is to make it happen automatically, without user intervention. And that’s why is should be tested by as many people as possible, to find all possible problems with it before making it an automatic process. It is (in my mind) quite easy to test, but my tests cover only my location in Europe, and I’m sure here I cannot test all potential problems. So, please test it to make Antergos a better system! Will do, tomorrow at the office. 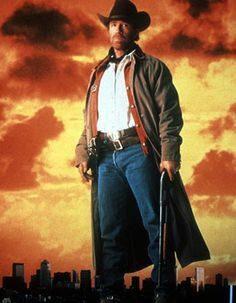 None of my machines at home has Antergos installed at the moment. If I remember well, there’s no Antergos mirror in Poland, so results may be interesting. By default, remirror waits at most 5 seconds for each mirror to respond. In my experience, (fast) mirrors in near by countries will respond well under one second. So if you want rank all mirrors, it may be wise to use the --tm=<seconds> option with a smaller value. Of course, if you put a very small value to it, more mirrors fail the ranking process and will not be included in the resulting mirror list. On the other hand, if you put a larger value (like 10 seconds), then most mirrors will get a ranking value, but the whole process takes much more time, especially when you rank the Arch mirrors. Alternatively, near by countries are usually the fastest (although not always up to date). 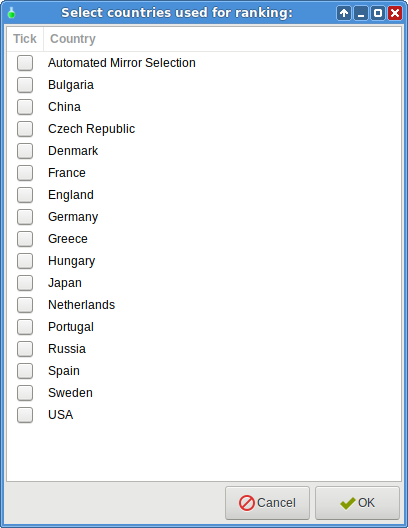 For example many German mirrors are both fast and up to date, so you might want to select the countries of the mirror to rank with the --c=<countrylist> option. @manuel German mirrors usually turn out the fastest in Poland. By the way: on my Arch-powered machines I only use (occasionally) this simple script. Here are some pictures of the GUI. Note that if I release the GUI, they may look different from this. These two are the main windows. 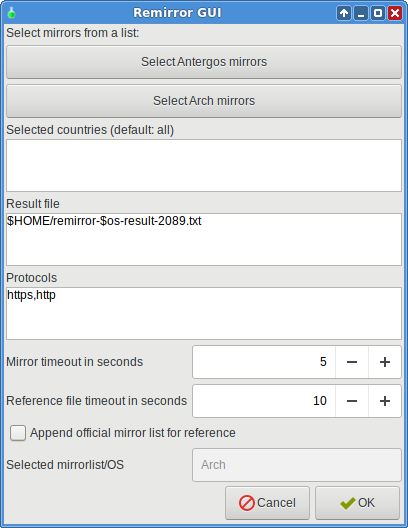 There is a third one, but it is similar to the Antergos mirror selection window, it only selects Arch mirrors (as you all may remember that Antergos uses Arch packages directly). So this gives you an impression of the current GUI status. It has no bells and whistles, and it is made using the yad package. Yes, reflector has been around for a long time, and it is a good ranking program. I just wanted to create a program (remirror) that can handle both Antergos and Arch mirrors, since the ranking procedure is technically very similar between the two. And remirror does not use reflector but has its own algorithm. @manuel Sure, the situation is different when you need to care of other repositories. I tested on my office machine, and all the options you named in the sample above seem to work well (however, replacing - with -- in the example may save another testers 30 seconds of life). I didn’t notice the screenshots yesterday, sorry. I hate coding GUI, too. The most boring part of programming. But actually there’s no need for fireworks, just simple windows which do the job, and you’ve already made them. Running the script as a systemd service with arguments based on user locales by default would be the best solution IMO. systemd-manager: bluetooth.service could not be enabled: "Interactive authentication required." Possibly the authentication issue only appears in Openbox. I’ll check GNOME later. With GNOME it doesn’t seem to work well, too. Authentication window appears, but the service seems to be started, but not enabled. Furthermore: even if it worked well, there’s more to do than just turning the service on / off, and a config file + remirror-gui would still have enough work to do. Would just like to let you know that I am a new user and I managed the remirror with no problems although it did not show up in pamac and I had to build it myself. One question is why does it say did not match on several??? I ran it with this command and really I think I will run it with even shorter next time because I still ended up with a lot of mirrors. I think next time I will try 2 instead 3 because 5 is just too long.